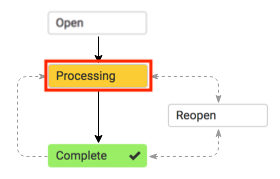 What is a Processing Order? the Order Status will change to "Processing"
Orders that are placed by the Buyer will initially appear on your Orders page as "Processing," which can be thought of as "pending" the approval of the Seller. We recommend that Sellers review the Orders at this stage, make any initial modifications, and communicate with the Buyer before moving on, especially if inventory is going to be deducted. From this point on, since the original Order was the one initially agreed upon, any edits made to it will require the Seller to click "Revise", which will log the revision in the Order History. Ideally, automatic notification emails to the Buyer should not be disabled so the Buyer can be informed of these changes. "Complete" does not mean that the Order has been paid for, shipped to the Buyer, and finished. It is simply a way to approve an order to be moved along for processing. Once an Order is then set to "Complete", additional functions will be triggered and unlocked, most notably inventory deduction. See What is a Complete Order? for next steps. Often it is helpful for teams to mark Orders as "Complete" to indicate that it has been reviewed and okay to move ahead with.